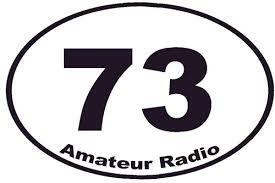 “73” goes back to the beginning of the landline telegraph days. The first authentic use of 73 is in the publication, The National Telegraphic Review and Operator’s Guide, first published in April 1857. At that time 73 meant “My Love to You”. In 1859 Western Union set up the standard “92 Code”, where it is noted as “accept my compliments”. By 1908, however, the Dodge Manual lists the meaning as “Best Regards” and this has remained ever since. If this is the case then “Very 73” would be “very best regards” and “Best 73’s” would then be “Best, best regards”. Former FCC Special Counsel Riley Hollingsworth has endorsed a list of several points that he feels help to define the concept of “good amateur practice.” Section 97.101(a) of the Amateur Radio Service rules refers to “good engineering and good amateur practice”- considered to refer to maintaining the highest standards of engineering and on-the-air comportment. But the rule lacks specifics. A Michigan Amateur Radio club has been credited with distributing a list of “Riley-isms” culled from Hollingsworth’s various talks at conventions and hamfests and club meetings around the US. Hollingsworth, who verified that he had been cited accurately – says his various comments represent an effort to flesh out what “good amateur practice” consists of for the considerate Amateur Radio operator. Copyright © 2002, American Radio Relay League, Inc. All Rights Reserved.